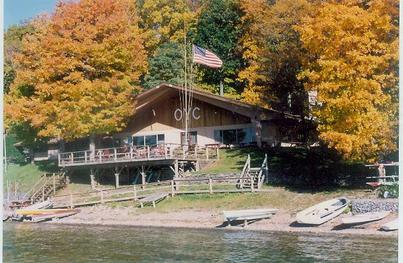 The Owasco Yacht Club has occupied its present nine acre site, located in the town of Owasco since 1946. The historical roots of this present Owasco organization, however, go back more than a century to the late 1800's. During the 1870's and 80's, several Auburn gentlemen developed an interest in the sport of sailboat racing. The boats were of a miscellaneous and nondescript character, this being long before any one design class had been thought of. There was no formal organization at this time, but Wheeler Case in “Along Owasco Water” writes of a triangular course at the north end of the lake. He says the entire course could be seen by people from Auburn who would gather in carriages and on horseback to view the weekend events. In 1889, some of these local sailors felt that their sport had grown to an extent that some formal organization was required and, on April 1, the first Owasco Yacht Club charter was approved. There were 42 male members and 25 yachts listed. The initiation fee was $2 and the annual dues were $1. At this time, the Yacht Club was simply an organization that provided a framework of racing rules and handicap formulas. The members neither owned property nor occupied a clubhouse. The first Owasco Yacht Club regatta was held on May 30, 1889. In the “Owasco Yacht Club Rules, By-Laws, and Regulations” dated 1892, Col. Frederick T. Peet was named Commodore. Col. Peet has always been considered the patron of boating on Owasco Lake, and current Club members still vie for a Fourth of July trophy bearing his name. The Colonel’s boat was a magnificent 50-foot schooner named Ouananiche, a French-Algonquin word meaning landlocked salmon. The vessel carried two lifeboats and full equipment, including a saluting cannon. She required two seamen as crew and the Colonel as skipper. In the early 1890's, the Owasco Yacht Club also had a presence at the southern end of the lake. 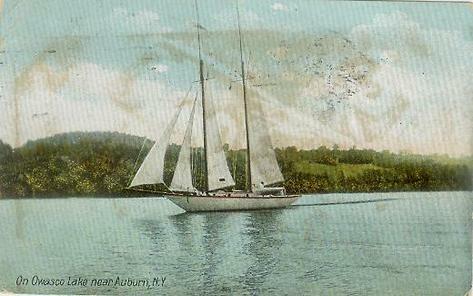 As reported by the Auburn Daily Advertiser, sailing races were conducted from Ensenore to Casowasco to Glenwood. This new activity was undoubtedly related to the fact that many of the Owasco Yacht Club members held dual membership in another l889 lake organization, the Dolphin Point Association. The Dolphins, as the members of this group were known, were once athletic rowing enthusiasts. Now, some 20 years after their prime, they were ready for some more leisurely lakeside pursuits. Forming the Dolphin Point Association, this assemblage of 30 stockholding members purchased Dolphin Point on the southeast end of Owasco Lake. After constructing a large clubhouse, which still stands, the member interest soon became focused on golf, tennis, lawn bowling and sailboat racing, the latter under the auspices of the Owasco Yacht Club sailing rules and handicap formulas. In 1896, the Dolphins laid out golf links on farmland adjacent to their property. This resulted in the organization of the Auburn Golf Club, which later changed its name to the Owasco Golf Club and moved to the north end of the lake in the Town of Owasco in 1901. Although the first Owasco Yacht Club represented a significant development in organized yachting at the turn of the century, it appears that in the early l900's the interest in competitive sailing dwindled for about two decades. 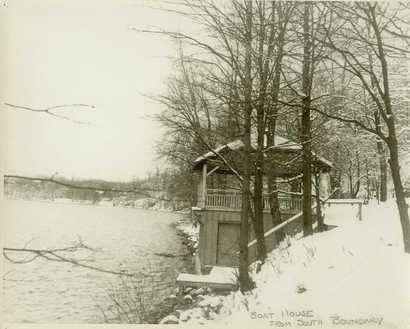 In 1920, races were again held at the north end of the lake with the race committee taking post on the Pump House pier. This renewed interest in sailing prompted a group of ten sailors to reorganize the Owasco Yacht Club, and in 1923, the members rented the farmhouse of Miss Mary McDowell on the south side of Buck Point. 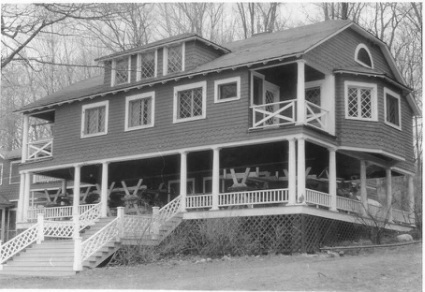 In 1926, as interest and membership increased, it was decided to rent, from Charles D. Osborne, the Four Mile House, located directly across the lake from the present Yacht Club. It was in 1926 that the present Owasco Yacht Club first became incorporated with Thomas Richardson as Commodore. At this time, the Yacht Club was still an organization established by men for the pursuit of their own yachting interests. Additional lakeside pursuits were always secondary to the principle goal of sailing. Other types of boating, swimming, and picnicking occurred only at times when there would be no conflict with sailing. It is recalled that on race days, no one was allowed on the dock unless they were skipper or crew of a competing yacht. The race committee, adorned in blue blazers, white trousers, and blue nautical caps, added to the element of sailing importance. This “strictly sailing” emphasis persisted until the early 40's. An important development in interclub racing occurred in 1930. A group of Central New York sailors, under the leadership and direction of Lithgow Osborne of the Owasco Yacht Club, organized the Central New York Yacht Racing Association. The third annual race of the new association was held on Owasco Lake with about 40 boats participating. This active organization currently has over 20 member clubs and still hosts the largest annual regatta in Central New York. The post war years saw an immediate increase in club participation and sailing. In the summer of 1945, there were 23 sailboats moored in front of the Club. What was now seen as the biggest problem confronting the organization was the condition of the clubhouse and grounds which had generally deteriorated during the early 40's. Up until this time, the Club had always rented their property; but when an offer to purchase the Four Mile House was turned down, a committee was formed to investigate properties around the lake for possible purchase. In December of 1945, Commodore Ken Bowen called a special meeting of the membership to discuss the purchase of “The Anchorage” property directly across the lake in the Town of Owasco. W. H. Seward III who died two years later. On January 16, 1946, Mrs. William Seward sold “The Anchorage” to the Owasco Yacht Club for $15,000. The Yacht Club purchased a plot of land approximately 500' from the highway to the waters edge and 630' of shoreline from a point marked by the present north boundary to a point just south of the steps leading to the swim area. In addition to a large summer house of late Victorian style, there was a garage, pump house, and small cottage at the north end of the property. At the lake side there was a boat house on top of which was a covered patio area known as the “lookout.” The main house was a two-part structure connected by a large second floor party room under which the driveway passed and separated the owner and servant sections. The north half of the building housed the servants quarters, kitchen and dining facilities. To the south were the principle living and guest areas of the owner. The interior of the entire building was faced with three inch tongue and groove panel, dark stained, and quite typical of the time. The south building had magnificent large porches on three sides and a stone fireplace in the main living area. The entire structure was a house of many rooms; unfortunately, none of them were big enough to accommodate a large gathering which, in years to come, would prove to be a liability. The task of converting this summer home into a yacht club got into full swing in the summer of 1946. By 1948, with a membership increase to 200 families and a dues increase to $25 per year, the Club had been connected to the Town of Owasco water system and a new 2,000 gallon septic system had been installed. Of the latter, the Board pledged the system would last 1,000 years. In subsequent years, members found this estimate to be somewhat of an exaggeration. Also in 1948, there began what for several years was one of the major social events in Auburn. The first annual Owasco Yacht Club Ball was held at Club Dickman with more than 400 people attending. The Dickman nightclub, currently the site of the large greenhouse at Dickman Farms, provided the members an opportunity to literally dance under the stars in the shadow of a huge indoor rubber tree. The profit from these dances was an important source of income to the Yacht Club. The dances lasted until 1956 when a smaller spring dinner dance for members was instituted. 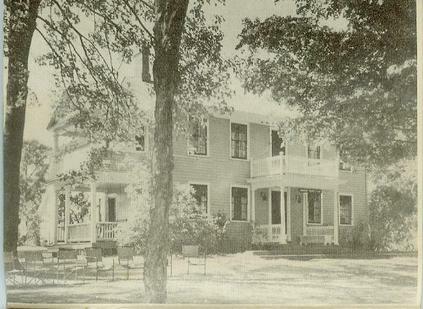 In 1955, an approach was made to Dr. Wilson, the club’s neighbor to the south, concerning the purchase of his land that he had acquired from Mrs. Seward in 1944. In June of 1956, under the guidance of Commodore Ralph Paul, the Wilson property was purchased which added 250 feet to the existing shoreline. All during this time, the personality of the Owasco Yacht Club was undergoing a subtle but significant change. Although there was still a keen interest in sailing and weekly races, the growing influence of other forms of lake interest could be seen. The Yacht Club was becoming a true family club with an almost equal emphasis on swimming, motor boating, water skiing, picnicking and other programs for all ages. It was also during the “Fifties” that what had always been a “dry” club became somewhat “wet.” Adult members, previously accustomed to a strict rule against alcoholic beverages on the premises, trespassed in the “brown paper bag era” and then felt the liberty to openly consume. un-nautical arrangement of ladies underwear was found flying from the Club flagpole. In December of 1964 at a general membership meeting, authorization was given to demolish the original clubhouse and obtain financing for the erection of a new building. It had become obvious that the continued use of the clubhouse would entail large repair costs. The foundation was in poor condition. Roof, plumbing, and electrical repairs were also needed. In addition, the clubhouse was not well suited as a gathering place for large functions. In May of 1965, the construction of a L-shaped, clear span, steel frame and masonry building began. Six months later, at a cost of $39,200, the building currently in use was completed. Officers Bob Battersby, Mert Turrell, Ken Clark, Charles Springer, and Nick Boglione were very instrumental in the design and completion of this structure. In 1976, a new septic system replaced the 1948 field that had been “guaranteed to last 1,000 years.” In 2002 the Yacht Club was finally able to abandon all dependence on what had been a less than adequate means of sewage treatment when connection was made to the new Town of Owasco sewer line. On July 4, 1977, a holiday event occurred for the first time when the Owasco Yacht Club “invaded” Burtis Point. Upwards of 50 Yacht Club boats headed south for a mock invasion of George Baird and his Burtis Point forces. The occasion, involving upwards of 250 individuals, was a source of great fun for children and adults alike. The Burtis Point cannons could be heard for miles around as the aggressors arrived. The Yacht Club’s imaginative use of a fire hose cannon, floating stockade, and Santa Claus, caused bipartisan observers to declare the Yacht Club the undisputed winner in each Fourth of July contest for several years. 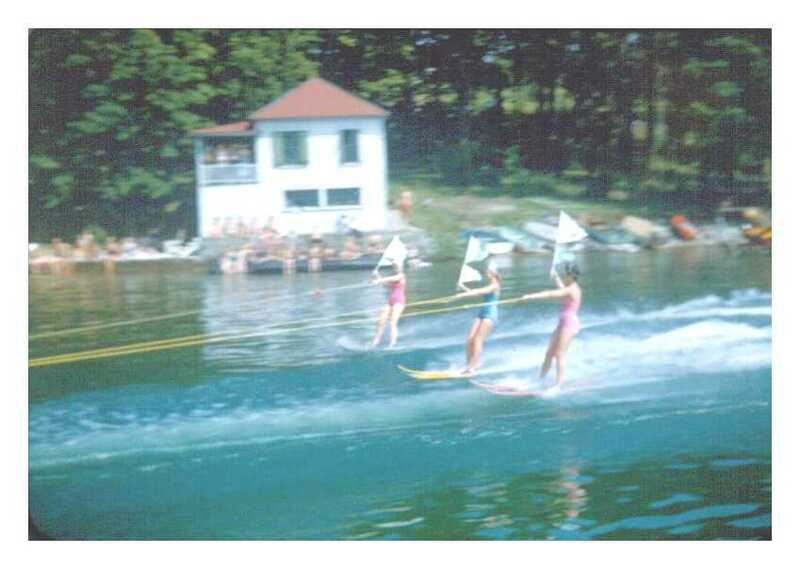 1986 saw the completion of a new 1,000 square foot lakeside deck in front of the clubhouse and a picnic shelter at the north end of the property. In 1989, a new concrete boat launch was installed at the south end of the property. Recent capital improvements have included the rebuilding of the sailboat launch area known as the “mole” and the picnic shelter wall behind it. A new concrete swim deck was also installed along with a new swim dock. Perhaps the greatest improvement, in terms of reducing member work effort, was the 2003 purchase of a floating boat dock that never has to be taken out of the water. From the time of Col. Peet’s sailboat Ouananiche to contemporary one design fiberglass racing boats, there have been hundreds of sailors learn the art of racing at the Owasco Yacht Club. Yesterday’s youthful crew members are today’s patrons of the art. Cat-boats, Mowers, Comets, Stars, Lightnings, Bantams, Lasers, and Flying Scots are just a few of the one design racing boats that Owasco sailors have skippered. The Owasco Yacht Club has produced two international champions and several district champions, the most recent being Peter Whiting in the Flying Scot class. Over the years, there have been several major sailing regattas hosted by the Owasco club. Boating is still a major focus at the Owasco Yacht Club. Sailboat racing is a weekly event on Sundays and Wednesday evenings. The Club owns several sailboats for junior sailing programs and for the use of the membership at large. The Yacht Club also provides launch facilities, mooring and shore space for an assortment of powerboats. Currently the mix of sail and powerboats is about equal. In addition to boating, however, families now use the Owasco Yacht Club for many other activities. Picnicking, restaurant dining, fishing, swimming, sunbathing, and weekly social activities are enjoyed by the membership. What has never changed throughout a 100 year history is the member’s love and admiration of Owasco’s waters.